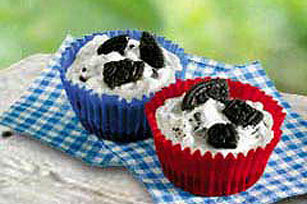 Whether the oven is otherwise occupied or you don't want to heat up the kitchen, these JELL-O No Bake OREO Cups are the ideal dessert for the oven-averse! Mix Crust Mix and margarine with fork until crumbs are evenly moistened. Press firmly onto bottoms of 12 paper-lined medium muffin cups, using about 1 heaping tablespoonful of the crumb mixture for each crust. Pour milk into deep medium bowl. Add Filling Mix. Beat with electric mixer on low speed 30 seconds, then beat on high speed 3 minutes. (Do not underbeat.) Remove 1/2 cup of the crushed cookies; set aside. Gently stir remaining crushed cookies into filling until well blended. Spoon evenly over crusts; sprinkle with reserved crushed cookies. Freeze at least 2 hours until firm. Store leftover desserts in freezer. Make this easy recipe with your kids!